The Student Recreation Center is our flagship facility. With more than 400,000 square feet of recreation space, there is something for everyone! Children ages 14-17 are able to use the Rec Sports facilities at any time under adult supervision. Additionally, all children ages 14–17, are required to show photo identification in order to use the facility. For additional questions regarding family usage, please contact the Member Services desk at 979.845.7826. *Family usage for children ages 13 and under is extended to normal operating hours during Texas A&M University published holidays, semester breaks and summer sessions. Room 243, known as the Archery Room, has a capacity of 450 for banquets, and for archery can accommodate 60 shooters/150 spectators with 14 archery target stands, four bow racks, one archery net, shooting lines. The Equipment Etc. Desk, (845-4917) assists guests with retail sales, equipment checkout, towel service, day locker rentals, handball, racquetball and squash court reservations. There are four dance/activity rooms for Group RecXercise and Specialty Programs. There are now 3 Gymnasium areas that can be used for basketball, volleyball, indoor soccer, and badminton. Gymnasium space can be divided into four basketball, four volleyball or 12 badminton courts. The gyms feature three regulation size indoor soccer courts with rounded corners, dasher boards and Plexiglas. These courts are used for open recreation and intramurals. This room houses 3 heavy bags, 3 speed bags, and a BoxMaster training station. It is typically open for drop-in recreation but is periodically used for boxing related specialty classes. 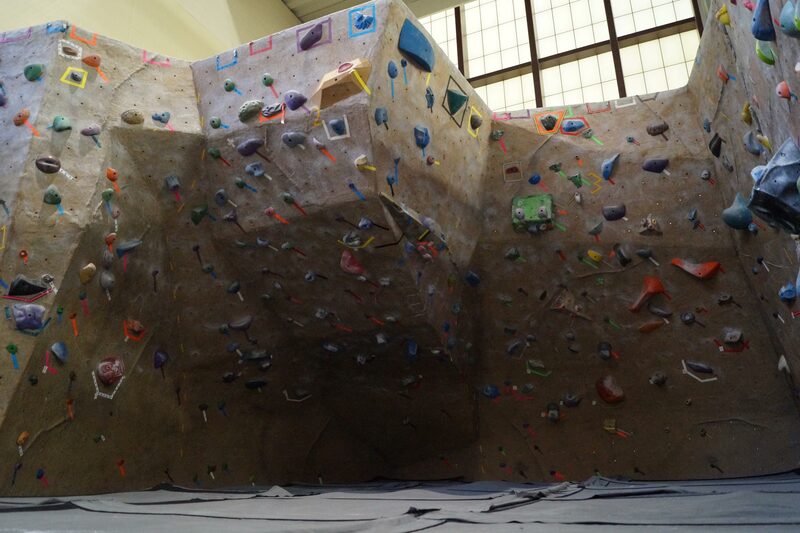 The Indoor Climbing Facility (44′ high) has approximately 3,500 sq. ft. of climbing area and combines integral rock and moveable hand and foot holds. It also features 10 top ropes and hosts instructional courses from beginner to advanced. Group facility and private party rentals are available. This 8-lane, 25-yard shallow water indoor lap pool provides an additional option for our members and guests to meet their recreational swimming needs, especially when we host large swim meets. Men’s and women’s locker rooms have over 2,300 lockers in three sizes, private shower areas, hair dryers and vanity areas with electricity. The Lounge and eating area has tables and chairs, lounge furniture, couches, television, vending machines and great observational area for many activities including indoor climbing area. The Member Services Desk (845-7826) assists guests with membership sales, intramural and program entries, massage appointments, locker rentals, lost and found and guest services. Each of the multi-purpose/activity rooms are outfitted with high-end audio video systems and wi-fi and can be set up in a multitude of ways for a wide variety of uses. Room 1130 – This 3,500 square foot multi-purpose room is utilized for events, small to moderate sized banquets and gatherings, group fitness and specialty classes, departmental events, programs and presentations. This room has a nice outdoor patio space with views into Blue Bell Park. Room 1132- This room is set up in a fixed auditorium style seating fashion an can seat up to 80 people. It is primarily used for departmental and student meetings and presentations. Rooms 2221 & 2225 – These activity/fitness rooms are approximately 2,000 square feet each and are primarily used for group fitness classes, specialty classes, and Wellness Works classes, but are also periodically utilized for a variety of other activities. These rooms share a small, adjoining outdoor patio space overlooking Blue Bell Park. Rooms 2229A & 2229B – This large banquet room, when joined, is approximately 6,000 square feet, and when divided, is two separate 3,000 square foot rooms. These rooms are primarily used for large banquets, gatherings, workshops, and presentations and include upscale amenities such as a clouded ceiling, specialized lighting, and a large outdoor patio space overlooking Blue Bell Park. The Natatorium features competitive swimming pool with two movable bulkheads, competitive diving pool including a special needs accessible chair lift. Shallow water instructional pool has sloped entry and measures 20 yards with five lanes. There are also two spas, men’s and women’s varsity and visiting team locker rooms. The Outdoor Activity Area (Backyard) features four sand volleyball courts, three outdoor basketball courts, a resort-style outdoor pool, outdoor locker rooms, and an outdoor pavilion with picnic tables and grills. The Outdoor Terrace was created to provide a partially shaded area for Rec patrons and includes outdoor furniture, outdoor kitchen space, and restrooms. The 15,000 square foot terrace is located directly on the roof of the expanded Strength and Conditioning Room. Inside the recently renovated and expanded Strength & Conditioning Room is the new Personal Training Suite, fully dedicated to our personal training program and clientele.Personal training clients will no longer face waiting in line for access to equipment or struggling to find space to complete their workouts efficiently and effectively. With our new Personal Training Suite, clients will have access to an exclusive, exciting training environment with some of the best equipment in the industry, including Technogym Kinesis, TRX suspension units, customized rack systems, Power Block dumbbells, Skillmills, InclineTrainers, kettle bells, medicine balls and more! In addition, personal training clients will still have full access to our entire Strength & Conditioning Room and equipment during sessions with their trainers and when they come in to use the facility on their own. We have fourteen racquetball/handball/squash courts. Smoothie King offers a variety of healthy options including smoothies, breakfast tacos, burgers, sandwiches, quesadillas, specialty items, yogurt, salads, fruits, soft drinks, sports drinks, bottled water and much more! Located on the southwest side of the Rec Center near Olsen Field and adjacent parking lots, this entrance is open during all operating hours and provides our members and guests a convenient alternative to the main entrance. The Strength & Conditioning Room is now over 32,000 square feet. The free weight area is +10,000, the selectorized/machine strength equipment area is approximately 5,500 square feet, and the cardio equipment area houses over 80 pieces of cardio equipment. Inside the Strength and Conditioning Room is a small, indoor turf area for warm-up, movement training, and stretching. A personal training suite is also located in the room. Restrooms are located in the front entrance of the space. The Walking and running track is located on the third floor. It is approximately 1/4 mile, with area for stretching, stability balls and mats. The Texas A&M Natatorium is a world-class swimming facility. 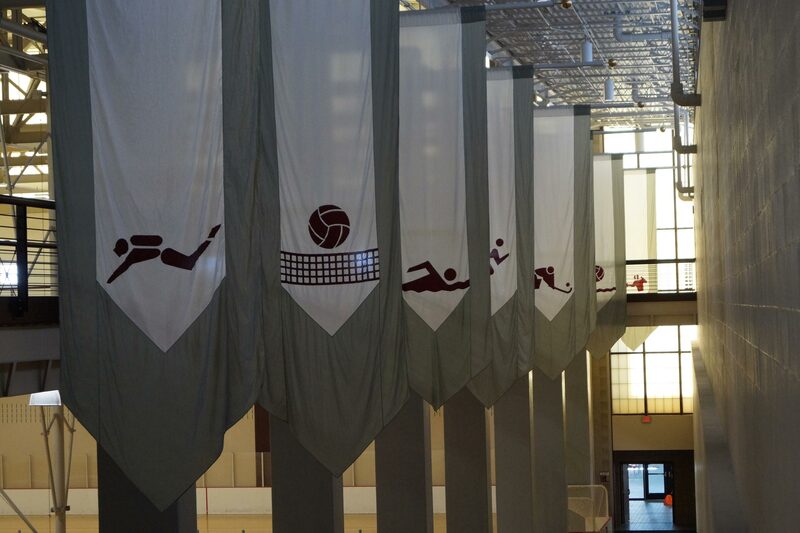 We host numerous tournaments throughout the years and in 2009 we were the proud host ofthe NCAA men’s and women’s diving and swimming championships. 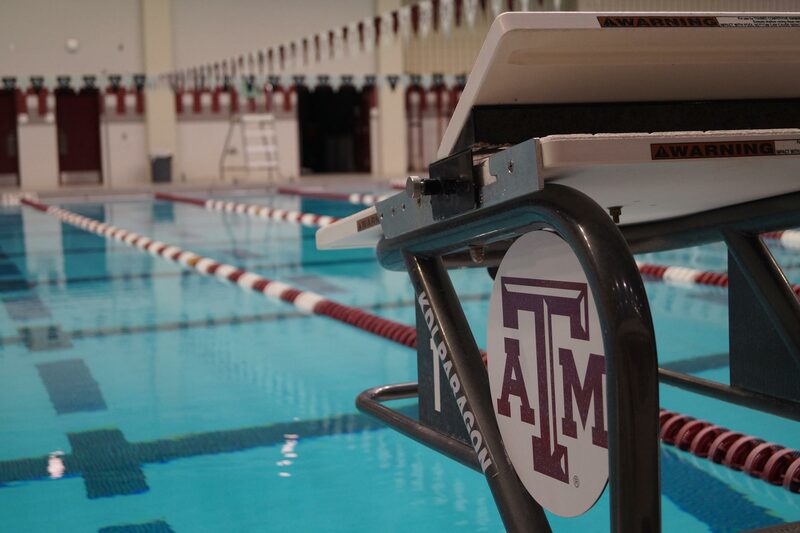 To receive updates and information about Natatorium facilities, programs and/or events please contact Carlos Garcia at carlos_garcia@rec.tamu.edu or CJ Stancheski at cstancheski@rec.tamu.edu. *Please see weekly pool schedule for pool availability. *Open weather permitting. If weather does not permit the opening of the Outdoor Pool, an indoor pool will be made available. Outdoor Adventures is home to our adventure trip and clinic programs, our outdoor equipment rental and sales center, and the Indoor Climbing Facility. Visit the Outdoor Adventures page for more information. Open to Rec members ages 18 and over any time the Student Recreation Center is open. Boulderers will be issued a pass for boulder wall use after signing a waiver and watching a safety video at Equipment Etc. or the Outdoor Adventures Resource Desk. All boulderers under age 18 must have a legal guardian sign their waiver before climbing. When bouldering, all climbers under age 18 must be accompanied by an adult. Rental Center (979.845.7035), located in the Student Recreation Center near the South Entrance at Lot 100J. Pick up and return outdoor equipment rentals here. For more information, call the Outdoor Adventures Resource Desk at 979.845.4511. The Penberthy Rec Sports Complex is the Rec Sports department’s outdoor field facility. Located at the corner of George Bush Dr. and Penberthy Blvd., Penberthy has artificial turf and natural grass playing areas available for drop-in recreation, intramural sports, sport clubs, and special events. The phone number for the Penberthy pavilion is (979) 862-3426. Calls will only be answered during hours that the complex is open for operations. For updated field status information related to inclement weather, please call the rain line at (979) 845-2625. Penberthy Complex pavilion: (979) 862-3426. Calls will only be answered during hours that the complex is open for operations. Rain line: (979) 845-2625. If fields are closed related to inclement weather, the message on the rain line will be updated. Reservations: (979) 862-1322. If you are interested in reserving field space, the meeting room, or the pavilion, please contact Tawyna Elliott. Additional forms and pricing information are available on the Facility Reservations page. All fields are lit after sundown. We utilize the ThorGuard lightning prediction system for assistance in determining whether the complex will be open during inclement weather. Use of Penberthy is restricted to Texas A&M students and authorized users. Fields may only be used when supervised by Rec Sports staff. If gates are locked, the complex is closed; unauthorized access may be considered trespassing. FOOD, SUNFLOWER SEEDS and GUM are not allowed on artificial turf playing areas. Participants engaging in recreational activity on the sports fields must wear athletic footwear. Equipment may not be moved without permission of Rec Sports staff. Individuals who move the large soccer goals may be removed from the facility at the discretion of the facility supervisor. Rec Sports staff have final decision-making authority regarding behavior not explicitly covered in the rules and the authority to remove patrons who do not abide by their decisions. For information about field status as a result of inclement weather, call (979) 845-2625. The Omar Smith Instructional Tennis Center is located on West Campus, directly behind the Texas A&M Varsity Tennis Center. Included in this facility are 18 state-of-the-art tennis courts—12 of which have lights—for Health and Kinesiology classes and recreational use by Rec members.